Herein lies a grab bag of pictures of weather over the Lake. 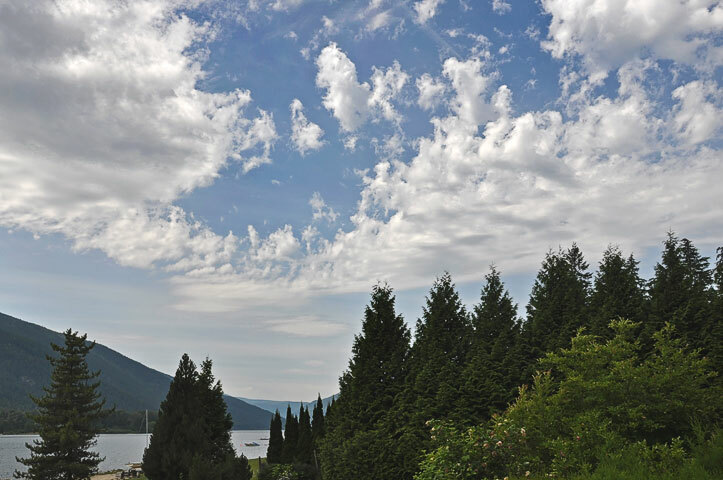 (Well, since weather is an inescapable characteristic of every view of the Lake, the selection here is merely one of emphasis). For some of the condensation mechanisms discussed below, it is useful to read: condensation. Castellatus This cloud looks like an odd mix of a wave–cloud base and little sprouting cumulus clouds. Indeed, that is roughly what it is. Wave clouds form when the atmosphere is stable, but sometimes, when a cloud in a stable layer is lifted, it becomes unstable and convective turrets sprout from the top giving it the look of a castle—thus the name, castellatus. As the convection destroys the base wave cloud, the now separated turrets get called floccus (lit., tufts of wool). Castellatus is symptomatic of pending thunderstorms. It is also the type of convection high in the atmosphere that initiates the fallstreaks seen below. Contrail The condensation trail from a jet aircraft is produced by vapour mixing. Vapour exiting the engines has a high temperature and pressure. Ambient vapour has a low temperature and pressure. They mix in the aircraft’s wake. 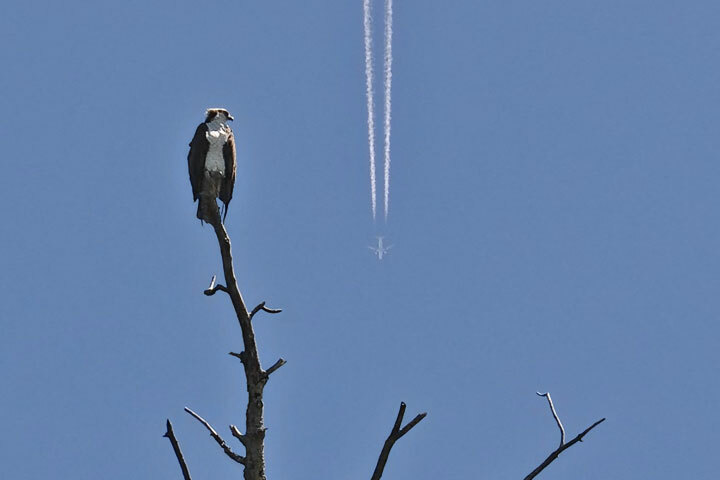 The osprey seems to contemplate alternative travel. This condensation which produced this frost resulting from vapour cooling. 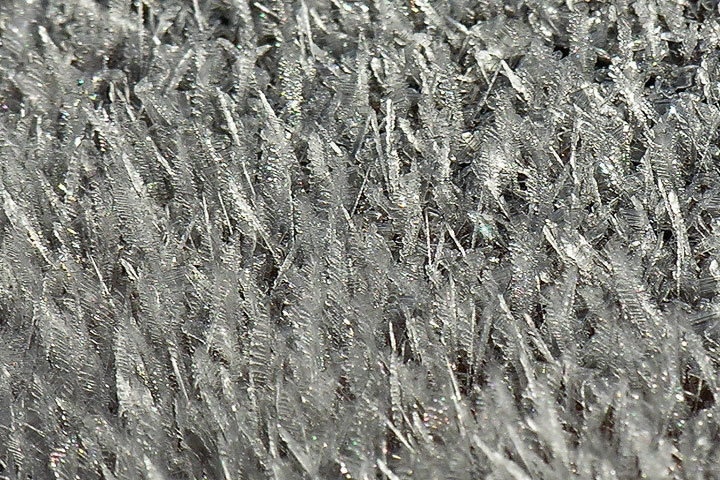 There was a net radiative loss of the surface on a clear cold night and vapour condensed on the surface as frost. 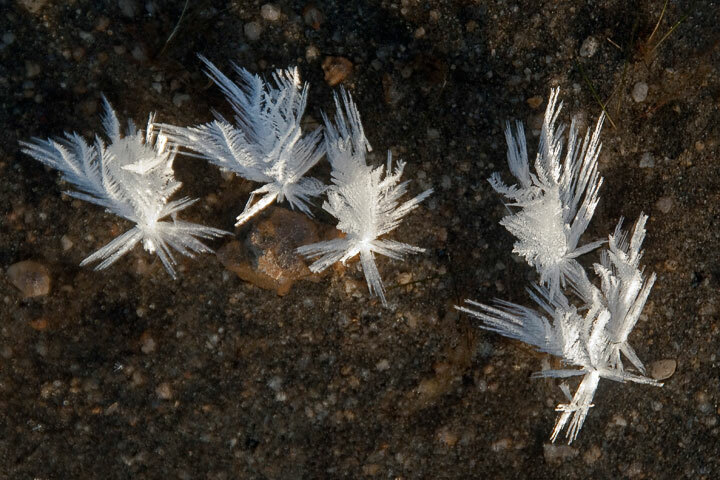 The condensation which gave rise to these ice flowers (also known as frost flowers) was prompted by vapour mixing (not vapour cooling as in the frost picture, above). These arise along the shore under the same circumstances as those which produce steam fog over the Lake (indeed steam fog was present at the time).